New Year's Eve is quickly approaching -- can you believe it's nearly 2016? Where did the year go? Our cats are probably wondering the same thing ... because they slept for most of the year: "Where did the year go? Did I dream the whole thing? By the way, where did my food go? Not dinner time? Wake me when it's time to eat." Yeah, that's what a lot of cats would say if asked about their memories of 2015, but that doesn't mean they don't like to party. Cats can be total party animals ... after a nice nap, that is. Cosmo's ready to party in his own Adam Ellis design. He's even wearing his tux. Many of us humans like to don fun hats, grab festive (yet annoying) noise-makers, and get our groove on at New Year's Eve parties. 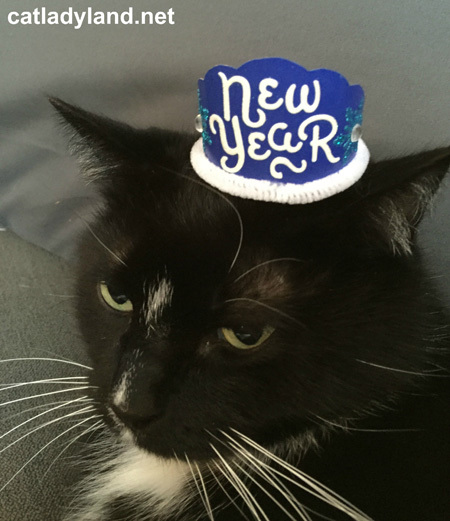 I admit it -- I've worn New Year's party hats. If you're gonna go all in, go all in. Why should people be the only ones with cool hats? This year, Tidy Cats is teaming up with tiny-hat designer, Adam Ellis to offer readers an opportunity to win their very own, hand-crafted tiny hat for their party-going kitty. But wait, there's more! Tidy Cats is offering the same winner a year's supply of Tidy Cats litter -- in the form of 12 full-value coupons. Free cat litter is a legit reason to party! Giveaway runs from now through midnight Central, January 1, 2016. Complete the Twitter portion of the widget if you'd like additional entries. Good luck, and Happy New Year to you and your kitties!